Here you will find the most favourite destinations for boating holidays in Phuket Thailand. Some of them can be reached on a private day trip. 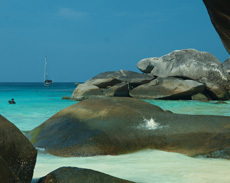 For Private Sailing Yacht Day Trip this is mostly Ko Racha Phuket or Ko Mai Ton. 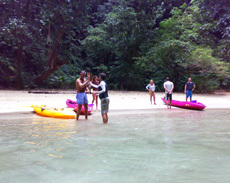 For Private Speedboat Day Tours the options are Ko Mai Ton, Phang Nga National Park, Phi Phi Islands or Krabi - Ao Nang. All the other islands can be reached during a multiple day overnight sailing charter starting from Phuket. Ko Mai Ton is always a good option for a private boat trip in Phuket. The island offers clear waters which are good for snorkeling. 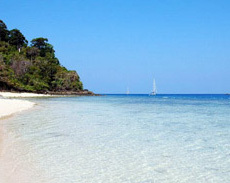 This island can be reached by sailing yacht and / or speedbot for a private day tour in Phuket. 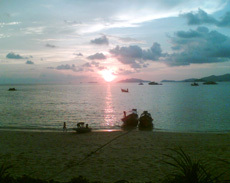 Racha Yai is about 12 km south of Phuket and offers good snorkeling and scuba diving. 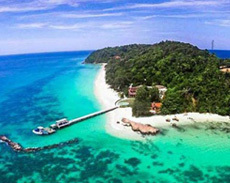 Racha Noi is further away and inhabited; a combination of both islands is a great weekend retreat. 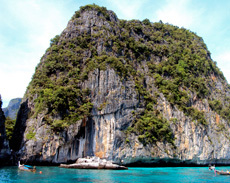 There are six islands in the group known as Phi Phi. They are about 50 km south-east of Phuket and are part of a National Park. A stunning place worth to visit. Phi Phi is too far away for a sailing yacht for a daytrip; this only can be done by speedboat or an overnight sailing charter. 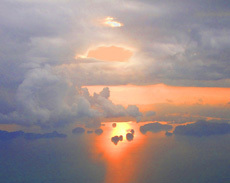 Phang Nga Bay has 42 islands. It looks a bit like a ferrytale scenery with its limestone formations, caves and beaches. Just imagine James Bond island and you got the picture. You will find fantastic kayaking in its famous "hongs" - the Thai Word for "room". The Krabi Province South of Phuket is noted for its outstanding natural beauty.There are limestone peaks, both on the land and sea. Great beaches and a relaxed party scene you find in Railey Beach. The Twin Islands are 30 km South of Lanta. Very nice and protectd anchorage with very clear waters. Ko Ha is great for Scuba Diving. You can safely explore a large cave while diving. Rok Nok is a great and very relaxed overnight stop. Ko Muk is famous for the Emerald Cave. Take your snokerling gear or a kayak and after a short trip trough a cave you will find a perfectly secluded lagoon. We will arrive there for a night anchorage that we can explore Emerald Cave Early in the morning, so we can have the Lagoon for ourselves. Turatao National Marine Park consists of 51 islands which are scattered from 20 to 70 kilometres distance. The Southern most end of the Park lies to the border with Malaysia. This is a very remote area with almost no other yachts. With the Catmaran you can go explore the Mangroves. Ko Lipe is relaxed and charming. Good for Scuba Diving. There are a total of 9 islands. The sea in the area has an average depth of 60 feet. Underwater it is full of rock formations, corals an vibrant marine life. Rated as one of the Best Scuba Diving Destinations in Asia.